Our Teams are in the Playoffs! 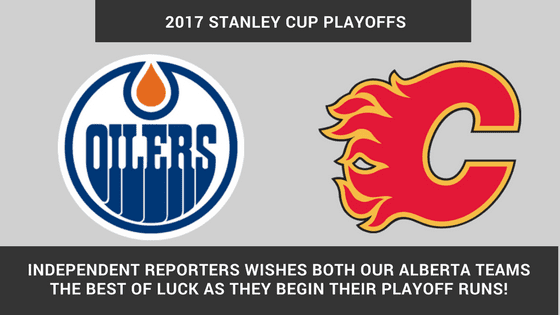 It’s been a while, but both our Alberta NHL teams, the Calgary Flames and the Edmonton Oilers, are in the 2017 Stanley Cup Playoffs! For both our offices, this means a bit of a rivalry. Although they are not playing against each other – yet – it does mean that the trash talking will begin as each game is played and each team wins or loses. The best part, should both our teams move out of the first round and continue on to the second, they will face each other. This means the Battle of Alberta will once again happen and bring on one of the best rivalries in hockey. We all remember from the past just how much each city hates the other’s team, so much is being hoped for in both the Oilers and Flames advancing to face-off against each other as they have in the past. All of us here at Calgary and Edmonton Independent Reporters will be very excited to see this happen and see whose team will get bragging rights over the other. Good luck to both our teams in 2017!